Before the race, certain drivers were expected to do well. Mike Rowe and Johnny Clark didn’t surprise anyone in the top three. But when the third place finisher showed up to run his first event of the season with an open trailer and 10-year-old motor, that turned some heads. “We're bringing home some hardware!” said Nichols into the phone. “We're going streaking! The thing was a rocketship." Nichols has only been racing a limited schedule over the past few season because of a tour of duty in the United States Coast Guard. But even the high seas couldn’t prepare him for 250 green flags laps at Oxford. "I wiped myself out, I'm telling you, I just gave it everything I had. I knew we had to save the tires, so we went slow there, I said 'Boys, I'm going get low and keep patient.' We put our second set of tires on and the car would just go." It’s not clear when Nichols’ next start will come, but when he plans out his racing schedule he hopes to be able to do something to pay tribute to a friend who has passed on – Scott Fraser. “I don't know [what my next race is],” said Nichols. “This is a Scott Fraser car, I think we deserve to go up to the Atlantic CAT 250 [in Nova Scotia] and see ol' Frank Fraser and visit with him. This one is for Scott Fraser." In the days leading up to the 250, there was a lot of talk about the outside groove, or the lack of such a groove when it came to racing. However, in the heat races one driver stood out when it came to being able to go outside and pass. That was Travis Benjamin. That makes just getting into the 250 a major accomplishment. Two young Maine drivers with family-owned small teams were just thrilled with the chance to get into their first running of the race. Lyman’s Alan Tardiff won his heat race to get in, while IBG-PASS regular Corey Williams of Boothbay, used a solid third-place finish in his qualifier to make the big show. The hard-luck Maine driver was just as impressive in the race, moving through the field quickly. But then his day went up in a ball of flames – literally. “This is just a pure fun race for us. It’s 250 laps of green flag racing and personally I’ve only run 100 laps and cautions counted. This will be pretty tiring on myself as a driver, but we’ll see what we can do. That’s not to say that Adams didn’t have to race hard just to earn his starting spot. In his qualifying event one week before the 250, he led late and crashed on the final lap. Adams did cross the finish line in second place, but when the apparent winner was disqualified for a technical problem, Adams was moved ahead in the finishing order. With only four transfer spots available in each 20-lap event, the heat races and consi for the 250 could get pretty wild. But none were wilder than the second consi. wasn’t bad, but it wasn’t as quick as it was. I think that if we had new tires, we have had something. Benjamin’s car erupted in flames in the middle of turn two. He parked it in the dirt bank off the track and appeared to be out of the car safely before it even stopped. Benjamin was credited with the 36th finishing position. He made it to within two laps of the halfway mark. When it comes to entries, this season was a little bit of an off-year at the TD Banknorth 250. There were “only” 71 cars that showed up for 40 starting spots. That was down from years past believe it or not. After Ryan’s busy weekend, the fact that he wasn’t driving the family car did not break his heart. Unfortunately, the #17R had a tough heat race and was withdrawn from the event. We’ll have more on that a little bit later. 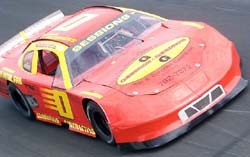 George “Mad Dog” Bessette is a well known racer from Connecticut, who has made quite a name for himself running SK Modifieds and Pro Stocks close to home. 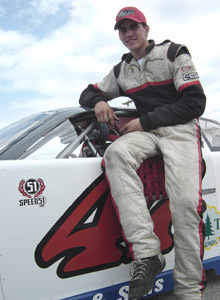 He’s been pretty good at it as well, winning a Pro Stock feature at Thompson Speedway in July for example. However, it was not his day at Oxford when he showed up to try and make it into the 250. Bessette got turned on the front stretch in his heat race and went head first into the outside wall. Bessette broke his back in the impact and remains resting in a Maine hospital this week. Bessette knows that the impact could have been much worse though. He credits his HANS device and Joie of Seating seat with saving his life. In fact, Bessette asked his car owner to call Randy Lajoie’s North Carolina shop this week to thank them for having building a strong seat. The TD Banknorth 250 qualifying races can be very stressful. Even this year’s winner Mike Rowe barely got into the main event. But there was one driver who had a little less stressful weekend than his pit area neighbors. Travis Adams won last week’s Late Model qualifying event at Oxford and gained an automatic starting spot for the 250 in the event that he did not make the race through one of the heat races. Ben would like to be standing here for the third year in a row at the end of the 250. 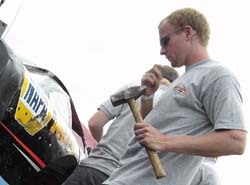 When Nick Nichols finished third in the TD Banknorth 250, those heads were being scratched pretty hard. Nick who? In the middle of his top three interview, Nichols paused to take a phone call from his father, a former Oxford racer himself. The excitement on both ends of the line was pretty obvious. But Adams did not want to have to use that card to get in, he ran the heats on Sunday to try and advance the hard way. Without the stress of having to race their way in on Sunday, the Adams team got to have some fun at the track. Getting in through a heat race made the remainder of the afternoon much less stressful for Tardiff and his team. Running the consis and last chance race just wouldn’t have been much fun. “We didn’t really want to run the consi or last chance qualifier,” said Tardiff. “Those races are rough and pretty much the luck of the draw. For Williams, the chance to get into the 250 is step one of fulfilling a two-part dream. While Tardiff and Williams were in the big show, there were plenty of other drivers on the outside looking in for this year’s TD Banknorth 250. 1996 250 winner Larry Gelinas, Sam Sessions, Gary Smith, Kelly Moore [more on that later], Jeremie Whorff, Bill Whorff, Jr., Chris Kennison [driving the car that Ben Rowe won the latest IBG-PASS race at White Mountain in], ACT Late Model regular Dave Wilcox, Scott Alexander, Dave O’Blenis, Steve Knowlton, Tony Ricci and Al Hammond were among the drivers who did not crack the starting field. Even eventual 250 winner Mike Rowe got into the race by the skin of his teeth. Rowe had to win the last chance race to get into the starting field and last year’s winner Ben Rowe needed the previous winner’s provisional to get in. WHICH MOORE IN THE #17R? 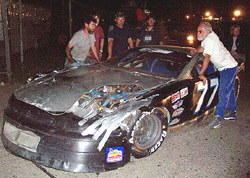 When the #17R was entered under the Moore Racing banner at Oxford, there was a question associated with it. Who would drive the car? 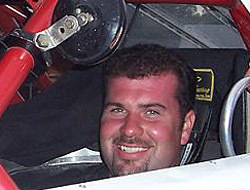 Would it be the all-time winningest NASCAR Busch North driver Kelly Moore or his son, rising star Ryan Moore. As the race got closer, a plan was hatched. Kelly would practice the car on Friday and Saturday and Ryan would race his Busch North car in upstate New York on Saturday night. After that race, he would drive to Oxford and run the car in the 250. Well, that plan did not come to fruition. Kelly ended up being the driver after all during Sunday’s qualifying events. Just a half dozen laps in, things got pretty heated up when Kelly Moore and Gary Smith didn’t play too nice with each other. There was bumping between the two drivers which ended with Smith’s #75 going around. A few laps later, Moore would tangle with the #00 of Jeremie Whorff. That wasn’t the end of the trouble for Moore or Whorff. A few laps after that, Whorff got turned around again by a different competitors and Moore came upon the scene with nowhere to go. This time, both drivers were innocent victims. Before the consi was over, Mike Rowe also got spun out. The ugliness of the heat races, and the fact that the next way to get into the 250 was a winner take all 50 lap last chance race, caused Moore to make the decision to just load up and go home early. Smith and Whorff both ran the last chance race, but neither one qualified for the 250. 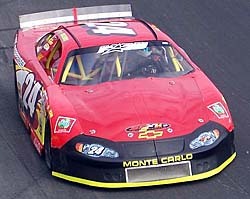 When the #24 car of Mike Rowe ran its heat races, its hood was bare. 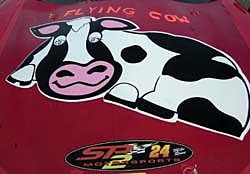 As it was rolled out to the starting grid, a cartoonish flying cow appeared on the hood instead. Ben Rowe won the last two runnings of the TD Banknorth 250, but this year his luck ran out. Rowe had trouble in the heat races and had to use a previous winner’s provisional to make the race. But things didn’t get much better for him then. Rowe got tangled up in trouble and finished the 250 in the 28th position. Speed51.com was so amused by the new character, that we just had to find out what the story behind it was. “The Flying Cow is a newsletter like the Coffee News,” said #24 team co-owner Scott Pullen. “They’re in Nova Scotia and are thinking about coming down to Maine and in a few other provinces of Canada. We met Ross Parks up at the Nova Scotia race that we won. He came up to us and said that he had been following Mike in the 250 for 20 years. After the #24 was safely in the show, a deal was made to gte the Cow riding along with Rowe.. But Rowe was far from dejected when the race was over. Having his father Mike win the event helped put Ben in a good mood as well. "That's three in a row for us. If I can't win it, he's actually next in line. It was a great day for me, we battled all day, just bent something in the front end and had to park it. I was sitting in the press meeting Wednesday, and if you guys remember correctly, I picked him to win, so this is no surprise to us. He's been good all year. It's great just to win one of these, I know the car owner told me at the beginning of the year that they wanted him to win one in the 250 and he did it." Ben was even looking forward after the race to the end of the season, when he plans to head south near Speed51.com’s home base and stir up some trouble. Cassius Clark and Patrick Leperle were both within 3/8th of a mile from a top finish in the 250 this year. Leperle started the white flag lap in fifth and Clark was right with him. Entering turn one, they tangled which didn’t help either driver one bit. Clark was credited with the 15th finishing position while Leperle ended up 18th. Neither driver was too thrilled about that. Both drivers had very fast cars that were more than capable of winning the race, but neither driver had a night that was trouble-free, even before they tangled with each other. “Maybe with 50 laps to go in the race when I was fifth, it was Ricky Morse in the 29 [who he had trouble with],” said Leperle of another incident. “I passed him coming out of 2, I didn't touch him, just after that there was a yellow, and under yellow, for nothing, he came and hit my right-front wheel and bent my spindle. For nothing, he's a lap down, I was fourth. 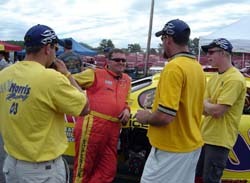 And Kenseth spun me out, too, what was his problem? I think we were fast for being toed-in an inch and a quarter, but the end was bad for us. It's okay, we led some laps, and can take home some more money like we did at Unity and Plattsburgh." 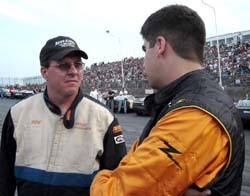 “My car was fast, but there was a lapped car running around like a moron at the end of the race holding everybody up,” said Clark referring to the #50 car of Jeff White. “They showed him the passing flag and he wouldn’t give us the track. I got by him, but it took 75 laps. I had to get lucky on the restart to do that. He held us up and Chubbuck too. I got going at the end. "The car was flying really, I finally got through that moron in the 50 car that was running everybody all over the track. I was coming on strong, got by Chubbuck, I ran into him going down the backstretch, I tried to move up on him, and he moved up a little bit, and the same thing happened with Patrick. They were protecting the bottom and they slowed down, and I went to the outside and I just caught him in the back end a little bit. Chubbuck saved it and Patrick took me out at the end there. He had it gathered up a little bit and just turned right and just wiped us out. We definitely had the car to beat at the end, that's for sure. The thing was hooked up, all night long really, just that 50 car just screwed us. Every time I'd try to go to the outside, there'd be a line of twelve cars, and then someone would be on the outside riding there for 30 laps, so I just couldn't do much with him. We had the best car at the end of the race, but just ran out of laps. Oh well." Getting into the 250, as explained earlier, was not easy for Mike Rowe, but after he was able to win the main event, it was all worth it. "It was nice to come back, you know we had to win the Hooligan race just to get in the show,” said Rowe. Once in the field, Rowe had plenty of cars to pass during the evening. “I don't know how many cars I passed, but it was too many. I was driving the wheels right off the car. I knew what I had to do, and we were a little quicker I thought until we had that four-tire stop, and that's what Seth called for. I felt like I was a little quicker than them. When the yellows come out, they're a little quicker than I am, and it takes me a little while to get going, but once I get going we're awesome." Rowe was thrilled with his latest accomplishment. 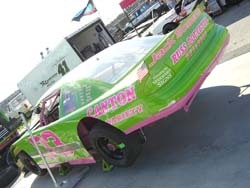 In 2004, Johnny Clark drew the number one pill when it came to heat races. He used that to lead every lap of his qualifier and then start on the pole for the 250. This year was a little bit different of a story. Well, Clark did lead laps late but with 10 circuits to go, he was passed by Mike Rowe. Clark came short when it came to the victory and finished as the runner-up, but it wasn’t due to lack of effort on the part of him or his crew. too hard there at the end,” said Clark. “The track gets so greasy here at Oxford towards the end of the race, especially at the 250. I bounced off the curb a couple too many times there, and the last time was the worst, and it shot me right to Turn 4. The curb here they've changed a lot, if you hit it, it shoots you about ten feet up the track. I hit it just coming off of 4 and it shot me down into the marbles on the frontstretch, and it was enough just to get Mike onto my rear bumper. As soon as he got there it was over. “Our pit strategy did work, it worked well, and the guys all busted their butts, and I'm real proud of them. All in all it was a good race, we just did not need to see that caution with 25 to go. We're getting closer and closer every year, so we'll be back for '06." Earlier we heard from Corey Williams after he qualified for the 250 for the first time. That was before he stayed on the lead lap all day and finished 12th in his debut. Needless to say, he was even more thrilled at the end of the weekend. Williams got caught on in a late-race logjam on a restart, but he came back from that without much of a problem. The other impressive thing about Williams’ race was that it came in a brand new car that the team finished the week before the 250 and never got a chance to go testing with. Last season, Kurt Busch ran in the TD Banknorth 250. This season, his younger brother Kyle drove to a sixth-place finish in the race. But that wasn’t because of any brotherly advice. Last season, Matt Kenseth finished third in the 250. 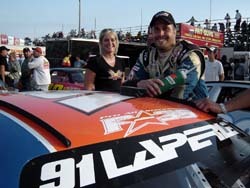 This year, he was back with the same Whorff Motorsports team, but struggled to a 16th-place finish. “(The car is) actually not as good as last year, we had a real good-driving car, we just got unlucky in our heat race and I didn't do a very good job,” said Kenseth. “This year we have not as good a car so far, but we've been lucky in the heats and got inside starting positions and kind of made it up through there. But I haven't been real happy with the car, we've been struggling a little bit so hopefully we can figure it out." What was wrong with his car exactly? There was a broad answer to that question. "You name it, mostly we just can't get it to turn the way I want it to keep turning,” said Kenseth. “I don't feel that good about our car. Last year, you know, our second practice session, third practice session, everything we changed made it better, this year we just haven't been able to hit, so right now I don't feel that good about it, but we always run, you know, as hard as you can and finish as high as you can. You never know, it's a long race, lots of crazy things happen." 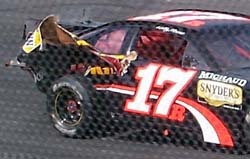 Last season, Scott Mulkern led laps in the 250 before getting taken out of the race after an incident with Kurt Busch. This year, he was also very strong, but his adversary was not a visiting Cup star, but a leaky power steering hose. "The power steering line blew,” said Mulkern. “The tires didn't really come in, either. It's too bad, I think it could've been good. We were one of the only cars that could pass on the outside, but there were way too many laps left to try and make it to the end like that. 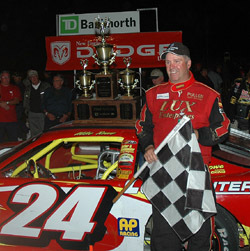 Dave Gorveatt had a long tow from Canada’s Prince Edward Island to get to the TD Banknorth 250. He also had a long race, with plenty going on around him in the cockpit of his #77 en route to a finish of 19th. "We had an entertaining night to say the least,” said Gorveatt. “We were sort of a pinball out there. The steering wheel fell off in the race, I couldn't figure out what was going on there. I had to take the center cushion out to see that the bolt in the lock had fallen out. I was able to get a bolt in it in the pits, and then the shifter got loose. We fixed the shifter, and then we lost clutch. It was tough, but we survived." What a difference a year makes. 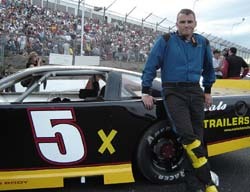 In 2004, Richie Dearborn did not qualify for the TD Banknorth 250. This year he finished fourth. "That was fun, but man, I wish we had 20-30 more laps,” said Dearborn. “We were really good on the long green flag runs. It wasn't bad, I guess." Seventh place isn’t exactly what Alan Wilson wanted out of the TD Banknorth 250. He was pegged by more than a few observers as a favorite to win the race. But he did come home in the top 10 with the same body panels on his #53 that were there when he started the race, so the event wasn’t a total disappointment either. Wilson had been an Oxford regular for years before signing up as an IBG-PASS rookie in 2005. He got to make two PASS starts at the track earlier this summer, but not running there every Saturday night might have hurt him when it came 250 time. Next up for Wilson and the PASS teams is Saturday night’s race at Riverside Speedway in Groveton, New Hampshire. “I like Groveton - they call it "Grovetona" I guess - it's a tight little bullring. I think we can make up ground there." It had to have been a frustrating finish to the 250 for Scott Chubbuck and his #29 Cushman Engineering team. They ran near the front all night long and seemed destined for a top five finish, maybe even a shot at the win, but when things got wild late in the going, they were in the wrong place at the wrong time. 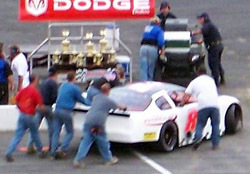 Chubbuck got crossed up with Cassius Clark while battling his own late race handling problems. Those two factors helped to change his top five run to a finish of 14th. Having old tires on his #29 didn’t help. But at Oxford, the balance of track position vs. new rubber also needs to be considered. After the race, it’s always easy to second guess a decision that could have paid off big. With the 250 now in the books, are there any big races planned this weekend for Chubbuck?